Old Man Logan #24 Review – AiPT! Don’t worry – this issue isn’t a total sobfest. After all, the series continues next month with a brand-new creative team. That’s right, Old Man Logan is entering the ResurrXion era! But we’re getting ahead of ourselves. Last time I checked, Asmodeus was sending Logan through time – not us! We pick up where we left last issue: After hopping from one major moment in Wolverine history to another, Logan is finally where he wants to be – with the family he lost to the brutal future Hulks. Logan’s late wife Maureen and two children Scotty and Jade have haunted him throughout Lemire’s run, so it’s nice to see them reunited one last time under the writer’s pen. But we know the happiness won’t last. Logan realizes it won’t last. Just as it was established in earlier issues of this arc, Asmodeus’ spell prevents Logan from changing the past. He’s forced to watch events play out just as he remembers them, no matter how painful that is. Heavy stuff, right? Really makes you think – would you want one more moment with a loved one you lost to tragic circumstances, knowing they eventually meet the same horrible end? After moving on, would the pain feel more raw than ever before? I won’t tell you how Lemire chooses to address these questions. What I will say is this is a Wolverine story for any readers who have struggled through grief. The issue’s conclusion certainly leaves the aged Logan in an interesting place. We’ll see what writer Ed Brisson and artist Mike Deodato, Jr. have in store for our hero. For much of this issue, Eric Nguyen gets to take a break from the action of previous issues and depict the quieter moments of Logan’s family life. Although this version of Logan hails from a pretty bleak future, Nguyen makes family life look good on him. It’s been an incredible run. As I mentioned in an earlier Old Man Logan review, I had no intention of reading this series. But I took a chance on it and loved all 24 issues. I hope Marvel releases an omnibus of Lemire’s entire run soon, as that eventual collection belongs on the shelves of die-hard and casual Wolverine fans alike. 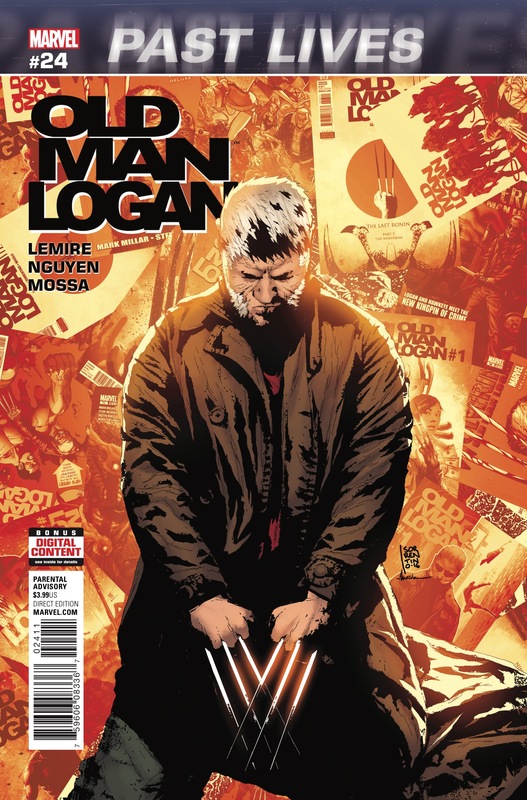 To you, Mr. Lemire, I extend an adamantium-clawed salute for a great run! And please, don’t be a stranger to the X-Men universe – you have a great handle on these characters. An emotional end to Jeff Lemire's terrific exploration of Old Man Logan. The Asmodeus plot wraps up a little too easily.